Nicola Sturgeon has accused Theresa May of "kicking the can" after the prime minister said she would ask the EU for a further Brexit deadline extension.Mrs May called for talks with Labour leader Jeremy Corbyn to "break the logjam" in the Commons over Brexit.Ms Sturgeon said the prime minister was "kicking the can and delaying making any decision" on how to compromise.The first minister had earlier proposed cancelling Holyrood's Easter recess if the UK is heading for a no-deal exit.Westminster looks set to sit through its Easter recess as MPs attempt to agree a plan for the UK's exit from the EU, and the Scottish government said it would be "weird" if MSPs took time away from Holyrood if a no-deal exit was looming. Mrs May has been unable to win backing for her proposed Brexit plan, suffering three defeats in the Commons, while MPs have failed to unite around any alternative after a series of "indicative votes".The UK's departure from the EU was put back from 29 March to 12 April following a summit of European leaders late in March. If MPs or ministers cannot come up with a plan, which is accepted by the EU, then the UK will leave without a deal.After an all-day meeting of her cabinet on Tuesday, Mrs May said she would ask the EU for a further extension to the deadline to "break the logjam in parliament".She said she wanted this delay to be "as short as possible" - before 22 May, so the UK does not have to take part in European elections - and that she would seek talks with Mr Corbyn to agree a new approach. In a post on Twitter, Ms Sturgeon responded: "This does seem very much like the PM kicking the can and, yet again, delaying making any decision that could break her cabinet. "What is missing is an answer to the question that many MPs faced up to last night - what is the compromise she is willing to make? "The SNP leader favours having a second referendum on EU membership, but her MPs have also backed proposals that would keep the UK in the single market and customs union to keep the option of a softer Brexit on the agenda.She said: "The sensible way forward - and I think one the PM would take if this was a serious attempt to build consensus - is to agree to fight an election, seek a longer delay and allow the option of a public vote on what the Commons says. "The SNP's Westminster leader Ian Blackford added: "Scotland has been utterly ignored throughout the Brexit process. "The SNP has shown we are willing to find a compromise position to end the impasse, but out priority remains stopping Brexit in its tracks. "Time is fast running out and the prime minister must now seek a long extension to Article 50, bring this back to the people through a fresh referendum, and keep the option to revoke Article 50 on the table to avoid a no-deal Brexit. "In her Downing Street statement, Mrs May said: "This is a difficult time for everyone. Passions are running high on all sides of the argument, but we can and must find the compromises that will deliver what the British people voted for. "This is a decisive moment in the story of these islands and it requires national unity to deliver the national interest." 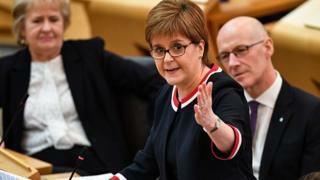 Ms Sturgeon had earlier agreed with her own cabinet that Holyrood's Easter recess should be curtailed if the UK is heading for a no-deal Brexit.MSPs are due to have two weeks away from the parliament from 8 April, clashing with the latest deadline.A spokesman for the first minister said "MSPs should not be on holiday" while the UK is "staring down the barrel of the disaster of no-deal".The move would have to be confirmed by Holyrood's cross-party business bureau management group of MSPs, but has been backed by the Greens and the Lib Dems.A spokeswoman for the Scottish Parliament said the bureau would consider its position "before the close of business on Thursday".It is understood the current proposal is that if the UK is heading for a no-deal exit on 12 April, Holyrood would sit that Thursday and Friday to provide updates and communicate resilience plans.Brexit Secretary Mike Russell said MSPs would need to "discuss issues involved, hear about work being done on resilience, and to prepare for the terrible situation we'd find ourselves in". Ms Sturgeon's official spokesman said that if the UK was "staring down the barrel of the disaster of no-deal, then members of the public would find it weird if parliament was in recess and not focused on the issue in front of them".He added: "The first minister's view is clearly MSPs should not be on holiday when the biggest, most momentous, potentially most damaging issue to hit Scotland and the UK since the Second World War is about to take place. "The Scottish Greens said it would be "quite right" for Holyrood to sit in light of the "unprecedented crisis" of no-deal, while the Lib Dems said there would be "a lot of frightened people out there" who would "need reassurances that their representatives are dealing with any issues that arise in a focused and collaborative way".However a number of MSPs hit out at the idea of recess being a "holiday", with several stressing that it was rather "a chance to catch up on local issues" and hold constituency surgeries.